The Sunset Playhouse has been a community theater fixture in Southeast Wisconsin since its stage lights were illuminated in 1960. Throughout its history, it has experienced successes and challenges, and has risen to meet those challenges every time. Often, obstacles faced are overcome because of the volunteers, the lifeblood of any theater organization. One such Sunset Playhouse volunteer, Marla J. Eichmann, is an undeniable example of one who has impacted its success. Walking through the doors of the theater in 1999 to try her hand as a props mistress, Marla became so enamored with the Playhouse that she traveled from back stage crew to leading the charge as president of its board. One area that required a re-focus was the Studio Theater. Built as an addition to the original structure, the intention was to utilize it for pre- and post-performance gatherings for the theater’s various patron groups. Additionally, there were dreams about using the space for small-scale productions that might not be a good fit for the Furlan Auditorium. The hope was to add another level of theatrical offerings, introducing and exploring lesser-known but important or edgier artistic pieces with a broader audience. However, lacking a dedicated resource to manage the usage of the space, Sunset slowly saw the Studio Theater become more of a financial monkey on its back. Marla and company had to closely examine how to forge a corrective path. As Board President, Eichmann, the creative Sunset staff, and a group of very generous volunteers sprang into action. They hit the ground running, brainstorming ideas to turn the Studio Theater into a hot-bed of activity. Today, that same Studio Theater space virtually never sees a quiet moment. It now hosts the popular SideNotes Cabaret Series and the newly-created After Sunset Series. Additionally, it serves as a rental space for private parties and events. Even more exciting, the Studio Theater has become a nurturing location for up-and-coming local artists and theater companies to stage special event performances. Marla has continued her focused dedication to Sunset’s success story. Her devotion to the theater has served as an inspiration to her sister, Laura Hohing, who has also had a long-time affection for the arts. 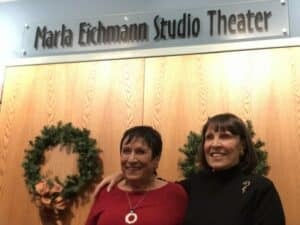 Laura graciously and generously donated to the Playhouse in December, asking only that the Studio Theater be named in her beloved sister’s honor, a request enthusiastically endorsed by the Board. The Marla J. Eichmann Studio Theater is busier than ever, showcasing productions from Pulitzer Prize-winning pieces to the wonderfully endearing performances emanating from the very successful theater education programs. The Sunset Playhouse’s Sparkling Sixtieth Season has been announced and the box office is open. Don’t just take our word; come see for yourself the incredible theater that is on display in both the Marla J. Eichmann Studio Theater and the Alan Furlan Auditorium. Remember….Entertainment begins at Sunset! Che bello! Theater RED proudly announces a new addition to the company! Eric Welch joins Theater RED as Artistic Associate following his collaboration with the company in June of 2018 for the Wisconsin premiere of I’LL EAT YOU LAST: A CHAT WITH SUE MENGERS. Eric Welch directed this one-woman comedic romp as a co-production with his theater company, Untitled Productions. The great secret of NINE is that it took “81⁄2” and became an essay on the power of women by answering the question, ‘What are women to men?’ And NINE tells you: they are our mothers, our sisters, our teachers, our temptresses, our judges, our nurses, our wives, our mistresses, our muses. Be Italian! New Theater RED Artistic Associate Eric Welch will direct NINE the musical, with music and lyrics by Maury Yeston and book by Arthur Kopit, in January of 2019. 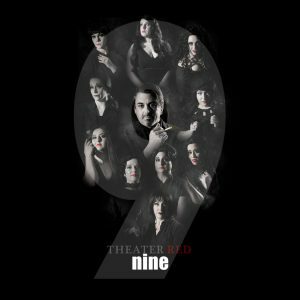 Reimagined with a cast of nine (9) women and one (1) man, NINE brings Theater RED alumni and newcomers together for a courageous, no-frills production that brings the core of Guido’s crisis to audiences up-close in Sunset Playhouse’s intimate Studio Theater. Based on Italian director Federico Fellini’s comic masterpiece of biographical filmmaking, “8 1⁄2”, Yeston’s sultry musical follows the life of world-famous film director Guido Contini as he prepares his latest picture. Contini is also, after recent box office failures, drifting towards a nervous breakdown. Contini has turned 40 and faces two crises: he has to shoot a film for which he can’t write the script, and his wife of 20 years, film star Luisa del Forno, may leave him if he can’t pay more attention to his marriage. As it turns out, it is the same crisis. Luisa’s efforts to talk to him seem to be drowned out by voices in his head: voices of women in his life, speaking through the walls of his memory: insistent, flirtatious, irresistible, potent. These are the women Guido loved, and from whom he derived the entire vitality of a creative life, now as stalled as his marriage. As his sanity disintegrates, he drifts into nostalgic reverie, eventually focusing on the formative sexual encounter of his life, which occurred at the age of 9. NINE is a musical, initially created and written by Maury Yeston as a class-project in Lehman Engel’s BMI Music Theatre Workshop in 1973. It was later developed with a book by Mario Fratti, and then again with a book by Arthur Kopit, music and lyrics by Maury Yeston. The story is based also on Frederico Fellini’s semi- autobiographical film 81⁄2. It focuses on film director Guido Contini, who is dreading his imminent 40th birthday and facing a mid-life crisis, which is blocking his creative impulses and entangling him in a web of romantic difficulties in early 1960s Venice. The original Broadway production opened in 1982 and ran for 729 performances, and starred Raul Julia. The musical won five Tony Awards, including Best Musical and has enjoyed a number of revivals. The 2003 Broadway revival featured a star-studded cast: Antonio Banderas, Mary Stuart Masterson, Chita Rivera, Jane Krakwoski and Laura Benanti, and won 2 Tony Awards itself, including Best Revival of a Musical and Best Supporting Actress in a Musical (Jane Krakowski). The movie [81⁄2] has a phenomenal impact on me when I saw it as a teenager when it first came out. I was fascinated with Guido who was going through his second adolescence when I was going through my first! As I grew I began to realize that there was room to explore the reacting of the inner workings of the women in Guido’s wake…I think that’s what opened the gateways of creativity for NINE – to hear from these extraordinary women. The intimate 88-seat Studio Theater is located at Sunset Playhouse in Elm Grove, WI and is the sister performance space to their larger 299-seat Furlan Auditorium. Sunset Playhouse is in the heart of the Elm Grove shopping district at 700 Wall Street with ample free parking available in their spacious parking lot. Sunset Playhouse is easily acceptable for patrons coming from all corners of the world (even Italy!). Visit https:// sunsetplayhouse.com/contact/map-directions for detailed, localized directions from the West, North, South, and East of Southeastern WI. About Theater RED: Theater RED produces theater in Southeastern Wisconsin. Each production addresses three founding tenets: Substantial roles for women, growth in craft for artists, and support for new playwrights. For more information: www.theaterred.com and www.sunsetplayhouse.com Be Italian with Theater RED in January 2019! Read Marilyn Jozwik’s review of : INTO THE WOODS. This wonderful musical by Stephen Sondheim will be performed by our very talented cast from March 1 – 18, 2018. The music and lyrics of Stephen Sondheim are not meant for the faint of heart, or faint of voice. His tunes take drastic plunges, have non-intuitive transitions and mood swings, while his lyrics come at you rapid-fire. 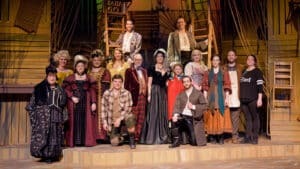 “Into the Woods” presents even greater challenges in staging and performing than “Assassins,” with its fairy tale settings and costumes, multi-layered tunes and larger than life (or, at least, stranger than life) characters. The book is by James Lapine. Lucky for Adams, he was able to assemble a cast of some of the finest talent around in local theater, many of whom I have enjoyed seeing onstage on a number of occasions. Adams may have ventured “Into the Woods” with a bit of trepidation, but returned unscathed, able to slay all the demons that the Sondheim music can throw at a cast and crew. In other words, it is a resounding success. Sondheim’s quirky story is a mash-up of fairy tale characters – Cinderella (Hannah Esch), Little Red Riding Hood (Ella Rose Kleefisch), Rapunzel (Lydia Rose Eiche), Jack (Simon Earle) and The Beanstalk. Of course, there’s a Wicked Witch (Laura Monagle). They are all brought together by the Baker (Nathan Marinan) and the Baker’s Wife (Carrie A. Gray), who have not been able to conceive a child due to the Witch’s curse. The Witch will reverse the curse, but not without strings: The couple must present a milky white cow, a red cape, a golden slipper and a lock of silky golden hair to the Witch. And so, the couple journey into the woods where they are able to procure these items – with great difficulty – from characters in the aforementioned fairy tales. At the end of Act I, all the characters seem to have gotten exactly what they wished for: Cinderella and Rapunzel got their men, Little Red Riding Hood and her grandmother got freed from the Wolf, Jack got rich – and his beloved pet back — after climbing the beanstalk and slaying the Giant. And the Baker and his wife? They got their baby. But all that unravels when the widow of the Giant, a Giantess, starts to wreak havoc on the fairy tale town … and not before many of the relationships begin to fray. There are decisions to be made at every turn, each character displaying a unique sense of morality in the choices. Some of the paths they choose lead to death, infidelity and greed, while other choices lead to friendships and changes of heart. Sondheim gives the audience little time to digest what they’ve seen and heard as familiar storybook scenes and characters speak and intersect in unexpected and surprising ways. This cast moves the story along with breakneck speed. This is an exceptionally strong cast throughout with no weak links, especially vocally. Music director Mark Mrozek gets a nice, full sound from five musicians who complement the lyrics without overpowering them. The show is cast wonderfully, each performer having the right look and bearing for his or her character. Setting the bar very high is Esch, whose Cinderella opens the show with a lovely soprano voice befitting a fairy tale princess. The other fairy tale(ONE?) 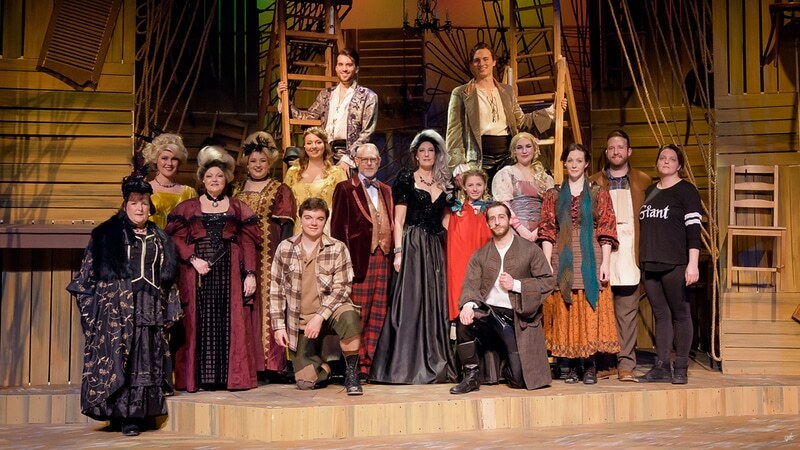 characters are also introduced in the “Into the Woods” prologue, each displaying an equally strong characterization. I especially enjoyed Kleefisch’s feisty characterization of Little Red Riding Hood. Marinan has such a sincere quality as the Baker and is nicely paired with Gray. Marinan is especially effective as the Baker sings “No More,” in which he wishes to run away and put an end to all the witches and giants in his life – a metaphor for his troubles. Monagle’s Witch is also delightfully wicked, as are Cinderella’s Wicked Stepsisters, played by Ashley Patin and Sarah Briana Monahan, who’ve camped up their characters. Earle has a breezy tenor voice and easy-going manner that adds irony to lines such as, “I buried her in a footprint,” referring to a dead character’s grave, i.e., a giant’s footprint. While other stagings of the show might be more literal, using mostly a woods backdrop, this production chooses more of a metaphor – at least that’s the way I see it. The stage is surrounded by large panels on which are hung – in a helter-skelter manner – chairs, small tables, shutters and other wood items. Perhaps it is symbolic of the chaos that surrounds the characters and the swirling array of decisions they have to make that define them and teach their children. It sort of reminded me of a still life of Dorothy and the swirling objects that surrounded her in the tornado scene in “The Wizard of Oz.” Cleverly, the chairs toward the bottoms of the panels are often used as set pieces and then hung back up. While it is an intriguing visual, the muddle of stuff tended to muddle the view of the characters as well. A less distracting setting would have spotlighted the characters better and focused on their performances. Story-high ladders wheeled in to represent Rapunzel’s castle and Jack’s beanstalk, among other settings, work well. The voice of Jana Rinelli as The Giantess resonating through the theater, as well as the booming sounds of the Giantess’ footsteps, are most effective, giving those scenes a boost of adrenaline.